Next year (I know, we’re already talking about 2017, it’s shameful), Apple will reportedly ditch its iconic Home button. Some consider it blasphemy, while others doubt it’s possible — but it can be done. What’s a ‘Home’ button anyway? When you really consider the interaction you have with the Home button, it comes down to this: a firm press. You’re essentially pressing down firmly on a piece of hardware in the iPhone that has limited purpose — it either gets you back to the home screen or wakes your phone. It’s actually that simple, too. According to the most recent reports, Apple wants to make a larger screen that eliminates some bezel while keeping the same overall footprint. Bigger screens are better, at least to a point. 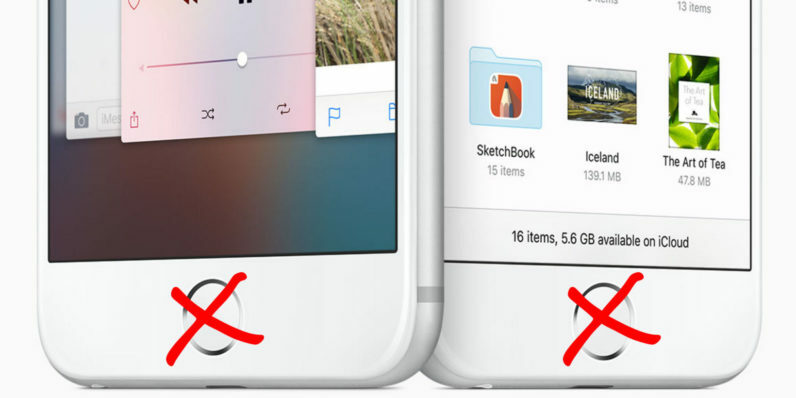 And if Apple can squeeze in an extra 0.2-inches, that’s a good thing. Home button hardware is also consumptive. Internally, iPhones have very limited space, so ditching the mechanism for a Home button would leave more room for… whatever Apple decides should go there (a bigger battery, maybe?). The Home button was widely considered pretty bland until Touch ID came along and gave it purpose. Their fates were intertwined, at least until now. Sonavation has pioneered a way to slip fingerprint sensors beneath the surface of a touchscreen. At the time it was announced, I wrote it could mean the end to your Home button. Turns out I might have called Apple’s shot (no wonder it won’t return my calls). If it can be done to scale, Sonavation’s technology would eliminate the need for Touch ID hardware on your phone. Even if sensors were positioned in the same area as Touch ID is now, the hardware can go away. Let’s re-visit our Home button idea again: it’s just a firm press. Apple recently introduced 3D Touch for iPhones, which offers the same thing as the Home button, only more contextual and without the need for dedicated hardware. I use 3D Touch most often on Twitter; a slightly firm press opens up a preview of a link, while a touch harder opens the article or video up full-screen. Apple would only need to bring 3D Touch to non-critical areas of the screen to make this non-Home button iPhone a reality. Those sensors on the bezel of your phone could do the exact same thing as the Home button already does while you’re in an app. And the haptic feedback engine would be able to provide tactile feedback for you so you know the harder press registered. Such a technology would also allow Apple to code in things like palm rejection; if you happen to mash a Home button, it probably sends you back to the home screen. I’ve hit it more than once while trying to capture a photo or video, ruining the moment. On the code level, nothing really changes. Touch ID is still an API, and the Home button can’t be accessed anyway. Apple’s possible change means very little to third-party developers; it’s all on the mothership to make things work. I’d assume Apple would house both the faux-Home button and Touch ID sensors in the lower bezel, possible across the entire bottom bar. Again, nothing changes; 3D Touch still applies to the screen proper, and all APIs are accessible. If there is a change, I’d expect Apple to make the ‘home’ function more extensible. A firm press may open up a menu, much like we see with app icons. From there, a quick hold might just navigate you to the home screen, while a longer press could offer to send you to recently used apps, settings or a menu of your favorite apps. It may also open up Siri. It’s a lofty goal for 2017, but many think Apple will go all-out for the tenth anniversary of the iPhone. As odd as it sounds, I can’t think of a better way to turn a corner than by eliminating dedicated hardware. The Home button and Touch ID hardware have carried us a long way, but if Apple says its time for them to go… I’ll be looking forward to what’s next.